When God carved out Cappadocia, He apparently had a little trouble keeping His hand steady. For this we must be thankful. This is made abundantly clear from the sky. As any visitor who has flown in a hot air balloon will tell you, the view of the many Cappadocia valleys is breathtaking. But the ground is the locus from which the valleys are truly to be enjoyed. Spending at least one day hiking through a Cappadocia valley (or mountain biking if that is your thing) is a must. 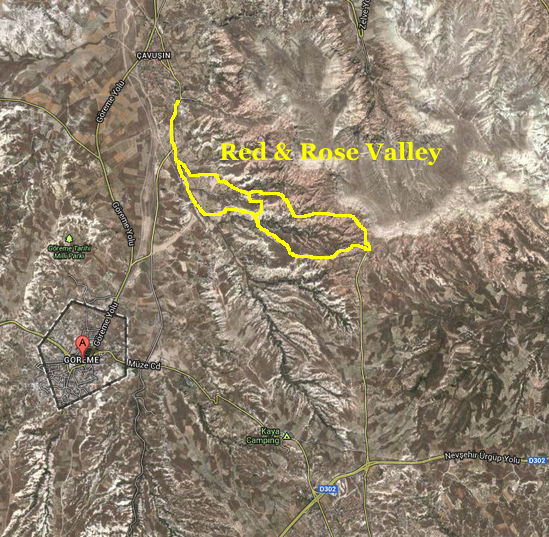 In the central Cappadocia area at least 5 valleys are easily accessible. Pack a bottle of water, take a picnic lunch if you choose, wear decent shoes/boots as the trails can be slippery and/or wet/muddy in places depending on recent weather. 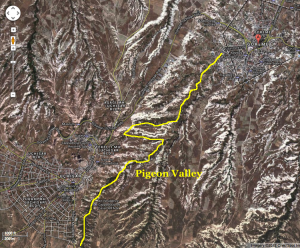 Expect to spend 3-4 hours in most of the valleys and work out transportation beforehand since they do not go in circles but end a few kilometers from the trailhead. This valley descends from Uçhisar to Göreme. You can go both directions but starting in Uçhisar is easier since it goes downhill the whole way to Göreme. This trail has two starting points in Uçhisar. The longer route starts on the backside of the town near the Overlook point. The shorter trail starts close to the fork in the Göreme – Uçhisar road. About 100 meters after the fork (heading up the hill from Göreme) you will see a sign for Pigeon Valley and bunch of wooden birds on poles). Once you get to Göreme look across the parking lot from the bus station, and you will find a public bus that leaves towards Nevşehir every half hour. This bus will drop you off in Uçhisar. This trail starts on the Ürgüp – Nevşehir road not far after the Uçhisar turn off (heading towards Ürgüp). The first dip into the valley is quite steep but after that the trail levels off for most of the way except for one spot for which you need to use a rope to go down a drop off (about 15 feet but not difficult). At one point the trail splits, and you must make a decision. Go left and you will follow a little plateau with great views and no shade. Go right and you follow the lower trail through the overgrowth, past cave churches, and in and out of orchards and vineyards. Both trails end at the same place on the Open Air Museum road outside of Göreme. Right past the Göreme Open Air museum sits the entrance to this mini-valley. 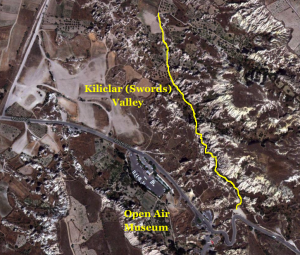 If you are in a hurry, this is the best choice as it is about half the length of the other valleys. Besides being shorter it is unique in its landscape as well having more accessible fairy chimneys and cave churches than the other valleys. If you have elementary-age children, this may be your best bet. It ends in the area between Göreme and Çavuşin. This is the most interestingly named of Cappadocia’s valleys. We will leave it to you to figure out what we mean, but we do not expect it will remain a mystery once you make the trek. 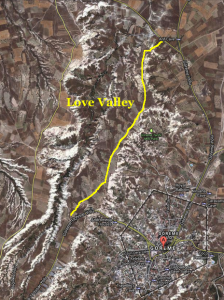 Love Valley is less of a trail and more of an opportunity to wonder around fairy chimneys and along the base of cliffs. This is another good one for children. Take a picnic and spend a few hours climbing and exploring. Which Cappadocia valley strikes your fancy? Be sure to leave a comment detailing your experiences.